DJ will be begun at the disco in Shinjuku Kabuki-cho 1974. 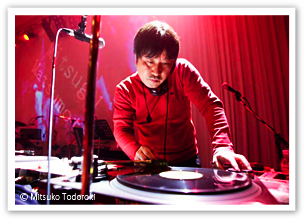 Since then, which acts as DJ at discos, such as Bobby Maggie, in Crazy Horse, Chester Barry, New York, New York, and Roppongi. Roppongi The Regency is also DJ additional post, continuing entering and New York, New York in the 80s. 97 years, Shinjuku Zeno It is under activity as active DJ at the last about DJ entering free DJ activity and still now. They are club discos, such as GOLD in the city of Tokyo, maharaja, the king & Queen, J trip bar, and AGEHA, as guest DJ after the 80s. It begins and is to the club disco of national each cities, such as Sapporo, Sendai, Kanazawa, Nagoya, Kyoto, Osaka, Fukuoka, and Kagoshima. Participation. They are musical pieces, such as activity, TMRevolution, Wink, Takashi Fujii, and ELT, also as a dance system music producer. It deals with a remix. Much CD plan work, such as a dance system artist's CD description, editorial supervision of disco system CD, and producing of nonstop mix CD, is assisted. The disco and dance system program of television and radio Appearing etc. works broadly. moreover, the music college of the Japanese Kogakuin vocational school -- the lecturer of "the history of popular music", etc. -- the charge . DJ style which mixed the peculiar talk is the big feature. 2013, rush to active duty DJ history 40 years. 2014, further continuing the play that has powered up facing a sixtieth birthday.